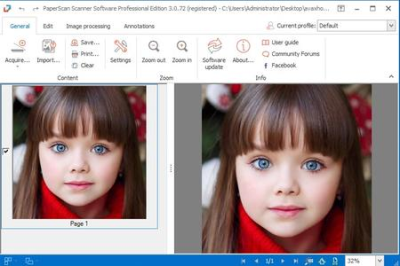 PaperScan Professional Edition is a powerful and comprehensive tool to manage the documents of your business or organization: scan, process, perform OCR, annotate, compress and save your images and PDFs in various formats. - Improvement of all document imaging filters such as Auto - deskew, punch holes removal. - New advanced printing dialog to specify alignment, adjustment, orientation. - Unlimited batch TWAIN & WIA scanning / import. - Save as single page PDF/A, TIFF, JPEG, JPEG 2000, PNG, JBIG2, WEBP. - Image processing during batch acquisition: auto-deskew, angle rotation, borders removal, punch holes removal, negative. - Support for scanning with separator sheets. - Post Image Processing: color adjustment, color space conversion, effects, filters, crop and more. - PDF Encryption support (read & write). - Flatbed and document feeder support.